** 592 suicide attacks were carried out during 2014. The claim that most suicide attacks are carried out against foreign occupiers has been proved false once again, says Israel’s INSS think tank summarizing 2014. from the 592 suicide bombing attacks 370 (62%) were in the Middle East, almost all of them against rival muslims; 124 (21%) in Afghanistan; 36 in Pakistan (6%); 34 (5.5%) in Nigeria and 15 (2.7%) were committed by women. Approximately 4400 were killed by the suicide attacks, a wast majority of the casualties were Muslims killed by Muslims. Between January and the end of July 2015, over 5,000 civilians have been killed and injured by suicide bombings globally. This is a 45% increase from the same period in 2014, which saw 3,463 civilian casualties. * 66 suicide attacks were carried out solely by women relative to only 15 a year before. In other 4 suicide attacks women were a part of the suicide team. 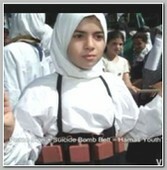 A quarter of the female suicide bombers were under 18 years in age. The number of casualties in 2015 remained stable – 4370. ** There are reasons to believe that many of the Nigerian suicide women came from the group of few hundreds teenager girls, known as the ‘Chibok girls‘, abducted by Boko Haram in 04/2014. Between 1981 and 12/2015, a total of about 4,850 suicide attacks occurred in over 40 countries, carried out by about 5500 suicide bombers, killing over 47,000 people. During this time the global rate of such attacks grew from an average of three a year in the 1980s, to about one a month in the 1990s, to almost one a week from 2001 to 2003, to approximately one a day from 2003 to 2015. As of mid-2015 about 3/4 of all attacks from 1981 occurred in just three countries—Iraq, Afghanistan and Pakistan.